With a location deep into the Arctic Circle, the quaint fishing villages at the foot of the mountains in Lofoten, Vesterålen and Senja offer a convenient base for a genuine Norwegian adventure. Here you will find plenty of rorbuer, traditional fisherman’s cabins that have been converted into charming holiday lodges. Expect a friendly welcome from the locals as they serve up a combination of fresh flavours and vibrant culture. Several of the lodges offer transportation to the skiing areas by boat. These tailor-made expeditions cruise along the islands' vast coastlines and deliver the passengers within reach of that coveted powder snow. 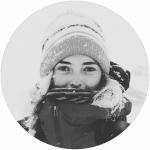 Operated by professional guides who will help you to access the best available runs, the programs are adapted according to the weather and local conditions. An early winter visit to this region gives you a splendid chance to spot the mystic beauty of the northern lights. On the other hand, the long skiing season also allows visitors to enjoy the magic of the midnight sun during late spring and early summer. This picture-perfect area further offers a range of exciting rest-day activities. From Arctic wave surfing at the Unstad Surf Camp to sea eagle and whale safaris, the islands of Lofoten, Vesterålen and Senja are a paradise for any winter adventurer. Stay safe and find out about the avalanche risk before you set out. You can check the avalanche forecast for Lofoten and Vesterålen and for Senja (on varsom.no). The stunning archipelago of the Lofoten islands in Northern Norway extend far into the Atlantic Ocean. It is a vast coastal area with jagged granite mountains, providing seemingly endless opportunities for ski touring. Summit-to-sea descents, testing couloirs and open birch forests are sure to meet the ambitions of every ski adventurer, whether beginner or advanced. 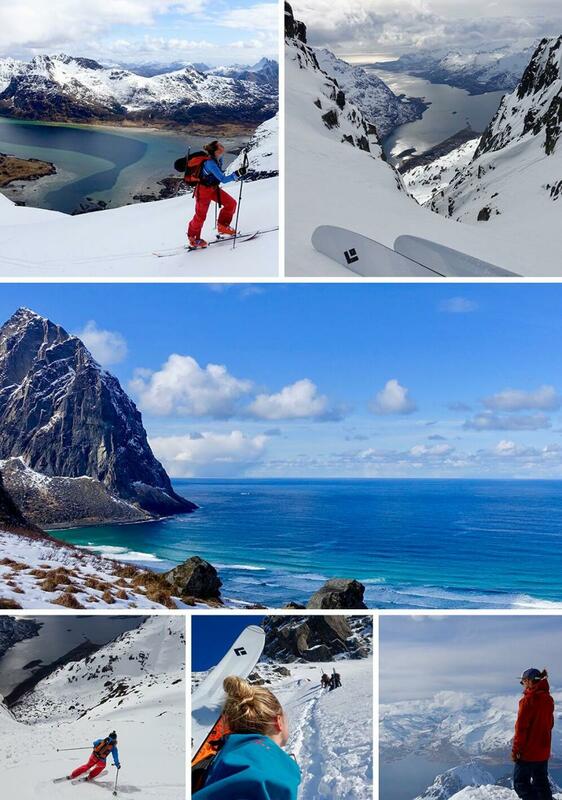 Read more about ski touring in Lofoten. Store Trolltind (1,036 metres) is a spectacular peak in Trollfjorden. Transport by boat to the starting point is required for this tour, which offers great skiing in wild and untouched terrain. North of Lofoten lies Vesterålen, a chain of craggy islands dominated by stunning peaks and beautiful fjords. The summits facing the open ocean on the outer side of the islands are ideal for ski touring. Due to its remote location, Vesterålen is one of the least visited skiing destinations in the north – so if you like solitude, this is the place for you. Read more about ski touring in Vesterålen. Stortinden stands some 1,000 meters above Vangpollen in Sigerfjorden. The western flank is an uninterrupted steep descent that ends right at the seashore. The exposed summit offers a panorama of the jagged skyline of Hinnøya. Senja, the second largest island in Norway, has equally great ski touring potential with peaks extending as high as 1,300 metres. Located in the county of Troms, Senja’s mountainous landscape is full of secluded hills that are perfect for shredding. There are no lifts around here. After skiing, you can go hunting for the northern lights, try ice climbing or fishing. 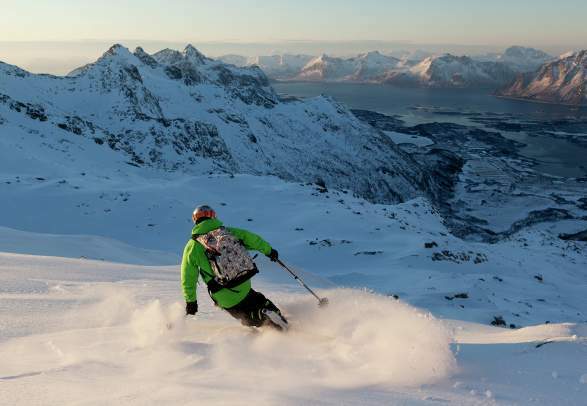 Read more about ski touring in Senja. Store Hesten (874 metres) has an unusually accessible run – you can start skinning right next to the the parking at Hestesletta. With spectacular views and a variety of descents, Store Hesten is considered Senja’s best ski touring mountain. Ski touring on Austvågøy, Lofoten. "Luckily for me, I discovered Lofoten", she says. "It's wild up there, big peaks dropping dramatically into the ocean, deep fjords and endless terrain for skiing. There are millions of cool skiing runs, with everything from nice mellow descents to death walls. Whatever you prefer, Lofoten has it. You don't have to be a pro to go ski touring up there, and you don't even have to like skiing. The scenery is a good enough reason to go – it's breathtaking." She continues, "one thing to keep in mind is the weather. It can go from the most beautiful bluebird day to a full-on snowstorm in 15 minutes, but that just adds to the adventure if you ask me. It's wild, it's beautiful and you should definitely go there if you get the chance." Vesterålen and Senja are two destinations on her ‘must ski’ list, partly because of the varied terrain and the chance to make your own tracks. "Whatever your preference, Lofoten, Vesterålen and Senja cater to all levels so they are well worth considering for any keen ski tourer! ", Malou concludes. "Best thing? The easy access to ski tours. Just park the car, put on your skins and get up there. If you stay away from the most popular tours, you will have the mountain all to yourself." Explore the unmistakable landscape of Lofoten as captured by local ski tourer Malou. In many cases, you can get to the foot of the mountain by public transportation, but the easiest way to get around is by renting a car. Get in-depth travel information at the official websites for Lofoten, Vesterålen and Senja. There are frequent and regular flights between Bodø Airport and Tromsø Airport on the mainland and Lofoten's three airports: Svolvær Airport, Leknes Airport and Røst Airport. Flight time from Oslo to Bodø and Tromsø is around 1,5 hours and an additional 20–30 minutes from there to Lofoten. There are frequent and regular flights from all the major cities in Norway to Harstad/Narvik Airport, which is the closest airport to Vesterålen. An airport bus service takes you to Sortland in Vesterålen in about 2 hours. Other airports in Vesterålen are Stokmarknes Airport and Andøya Airport, to which you can fly from Tromsø Airport on a regular basis.